Synopsis: Spud Milton (practically a man in most areas) is hoping for a smooth ride as he returns to boarding school as a senior. But instead he finds his vindictive arch-enemy is back to taunt him and a garrulous new boy has taken residence in his dorm, along with the regular inmates and misfits he calls friends. 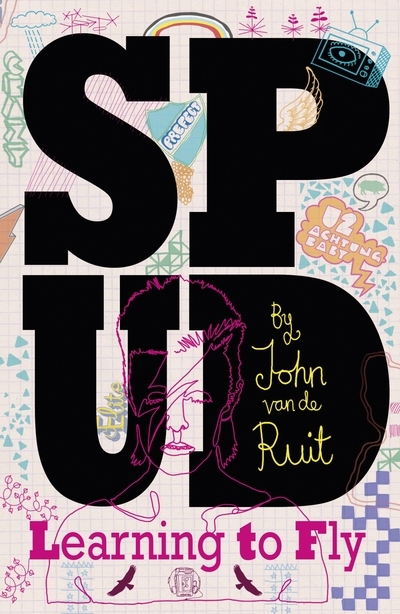 Spud's world has never felt more uncertain as he attempts to master Shakespeare, girls, religion and the meaning of life.Once again, armed only with his wits and his diary, Spud invites us on a hilarious journey deep into the sublime and ridiculous world of being a teenager. It’s often hard to recapture the atmosphere of the first novel in a series, and Spud: Learning to Fly is no different. Things have changed for the Crazy Eight; so too has Learning to Fly (Spud 3). No sequel could ever hold up to the outright-hilarious Spud, but Learning to Fly offers more than its fair share of gags and continuously made me chuckle during my reading. The story throughout Spud: Learning to Fly is more complex than in both Spud and Spud: The Madness Continues. The characters have come a long way now, and John van de Ruit certainly seems intent on keeping the sequels as original as possible. Of course, Spud wouldn’t be Spud if it wasn’t filled to the brim with eccentric characters. The Guv, particularly, is as eclectic as ever, providing more than enough raised eyebrows and guffaws. A couple of new characters are introduced (most notably that of Garlic, a strange, clingy Malawian who constantly talks about Lake Malawi and asks questions). Once again, Spud: Learning to Fly doesn’t fail to please. This is one of the few truly laugh-out-loud novels, characterised by its wonderfully whacky characters and bizarre situations. If you’re looking for something to entertain you, then you’ve found your match, and whilst it doesn’t offer quite the same amount of hilarity as the first novel, it sure provides a good laugh.